Comcast and AT&T are among the pay-TV and telecom providers in the storm's path. As President Donald Trump surveys damage from Hurricane Harvey, the full impact of the storm to local broadband and wireless networks is not yet known. The storm had knocked out more than 280,000 cable and wireline telecom hookups in Texas and Louisiana by Tuesday afternoon, the Federal Communications Commission reported. The count is up significantly since Monday, when the government reported that nearly 190,000 cable and wireline customers were out of service. Close to 5% of cell sites were out of service throughout the 55 counties in the disaster area. The coastal Texas areas just northeast of Corpus Christi were hit especially hard, however. In Aransas and Refugio counties, the FCC noted that 84.2% and 73.1% of cell sites, respectively, were out on Tuesday. Coverage has improved since Monday, when Aransas and Refugio counties had outage rates of 94.7% and 84.6%. Storm-ravaged Houston is one of the biggest markets for Comcast Corp. (CMCSA - Get Report) , with 500,000 subscribers to at least one of its products, Macquarie Capital analyst Amy Yong noted in a report. 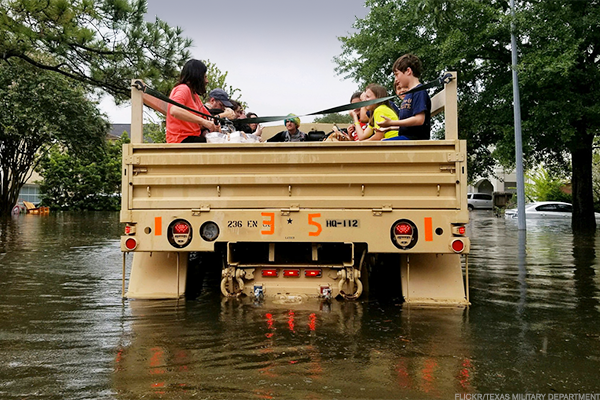 The Philadelphia cable and entertainment giant suspended operations in Houston until local emergency management agencies say the streets are safe. Comcast is a holding in Jim Cramer's Action Alerts PLUS Charitable Trust Portfolio. Want to be alerted before Cramer and the AAP team buy or sell CMCSA? Learn more now. For a reference point, Yong noted that when Hurricane Sandy hit the Northeast in 2012, Cablevision Systems Corp., since acquired by Altice USA Inc. (ATUS - Get Report) , gave customers $33 million worth of credits and booked about $109 million in storm-related costs. Headquartered 240 miles to the north in Dallas, AT&T Inc. (T - Get Report) has a sizable presence in Houston. The telecom invested about $1.5 billion in wired and wireless networks in the city from 2014 to 2016. AT&T also boosted network capacity in NRG Stadium ahead of the New England Patriots' victory over the Atlanta Falcons in Super Bowl LI. AT&T said it would waive fees for wireless customers in areas hit by the storm through Sept. 3 at the earliest. Charter Communications Inc. (CHTR - Get Report) has about 10% of its customers in Texas, following its $78.7 billion acquisition of Time Warner Cable Inc. in 2016. Most are in markets such as Dallas and San Antonio that are well outside Harvey's path, Yong observed. Still, Charter has exposure in towns such as Corpus Christi and Beaumont, which were in the storm's path. Frontier Communications Inc. (FTR - Get Report) set up stakes in Texas as part of $10.5 billion purchase of wireline operations from Verizon Communications Inc. (VZ - Get Report) last year. Not only did Verizon exit its Texas wireline operations in 2016, the New York telecom sold its Houston data center to Equinix Inc. (EQIX - Get Report) as part of a larger, $3.6 billion deal in May.